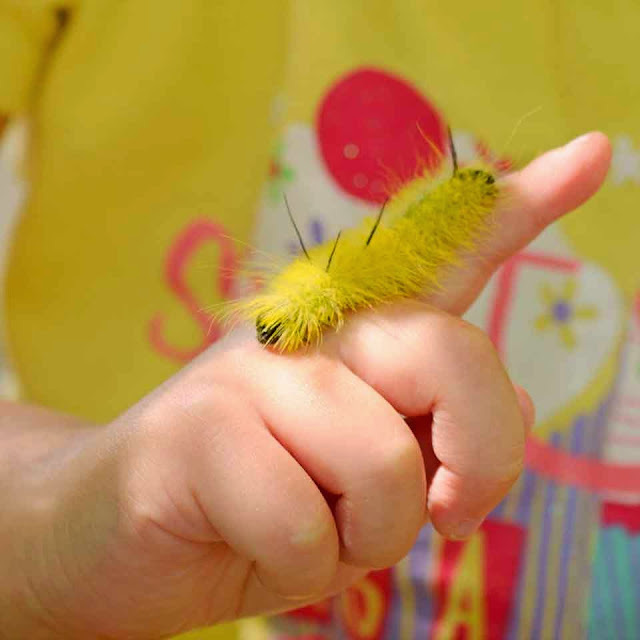 Remember what I said after we escaped unscathed from the encounter with a White-Marked Tussock Moth (Orgyia leucostigma) caterpillar at Rouge Park? 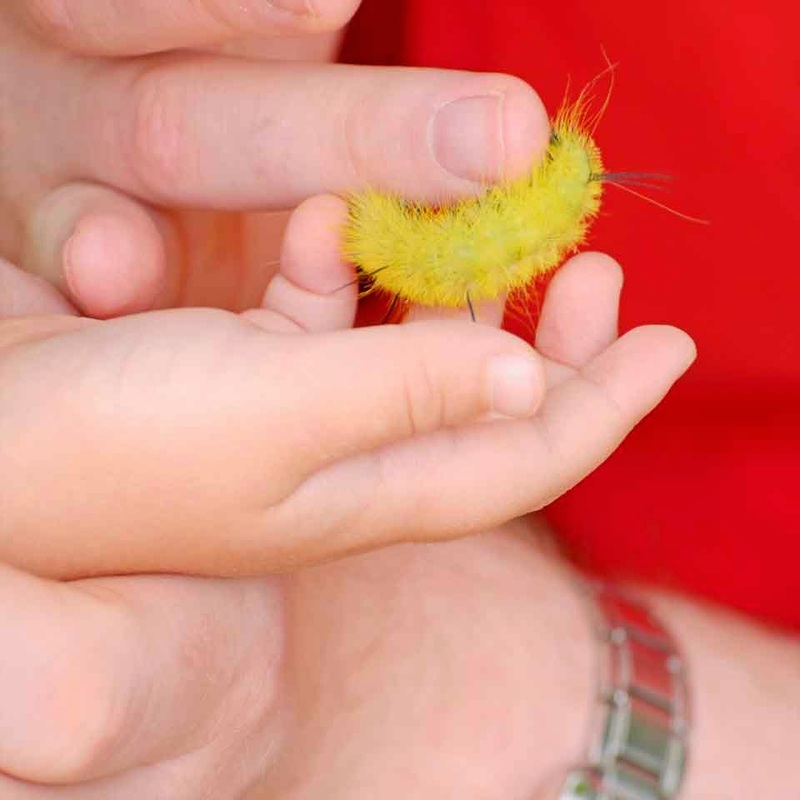 Never again, I lectured my family, will we pick up unknown creepy-crawlies, and let them roam unchecked over bare skin where they could cause bumps, rashes, welts or worse. I went on along this line of reasoning for at least ten minutes, ad nauseam, and I saw two heads bob in agreement that of course, I was absolutely right. The two "kids" - my husband, the gleefully bug-obsessed, and my daughter, the intrepidly curious - almost stepped on this fuzzy, bright yellow caterpillar with black, spiky "hair" as we were walking through the grass in front of Burwick House at Black Creek Pioneer Village. 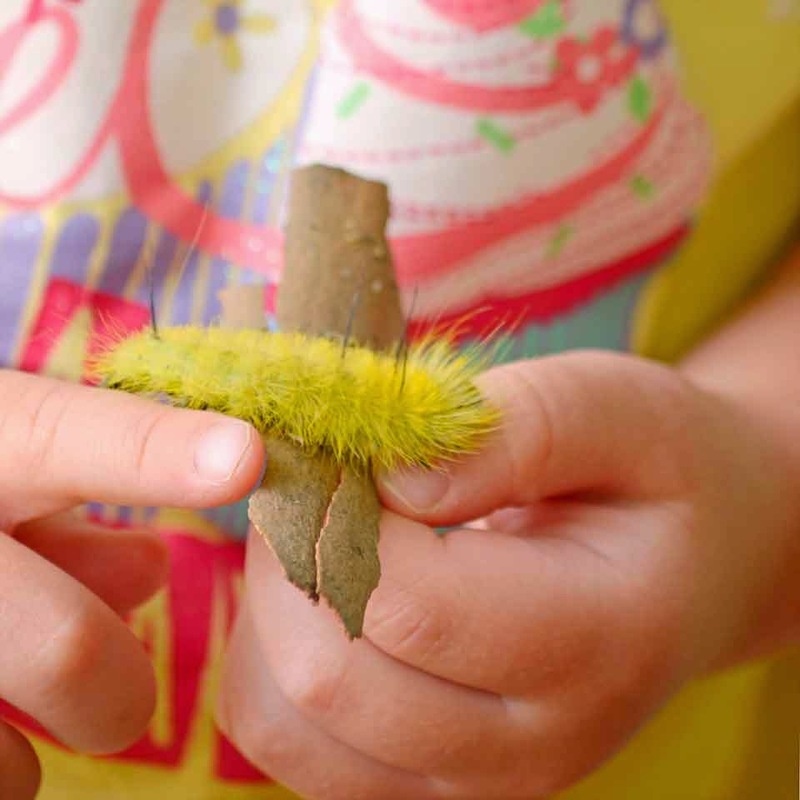 Since there was a pretty big horde of pre-schoolers and summer campers running around (we had seen two big school buses pull up with them when we arrived), the caterpillar naturally had to be "rescued" so it wouldn't get trampled if a stampede should ensue! Whether it was dumb luck, tough skin, mutant genes or a combination of all three, the audacious duo once more escaped unharmed from handling the furry critter. 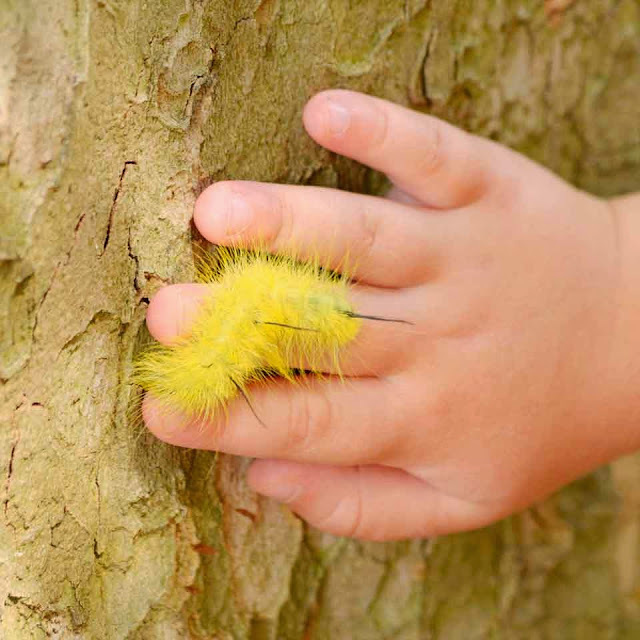 According to a Google search, the hairs or setae of the American Dagger Moth (Acronicta americana) caterpillar can trigger mild to severe reactions in people. It seems to affect children more (I guess they are less tolerant of the toxin contained in the black "spikes") so I wouldn't advise letting your child touch it unless you're prepared to risk a possible trip to the doctor. 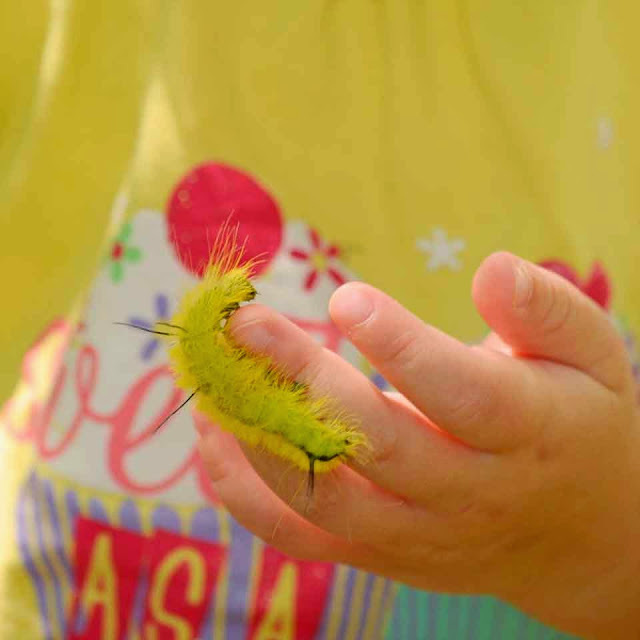 Here is a somewhat old but really good link to a post and comments about the caterpillar's behavior and lifecycle, and here is a post from Kelly, a Cincinnati mom whose son did experience a reaction. 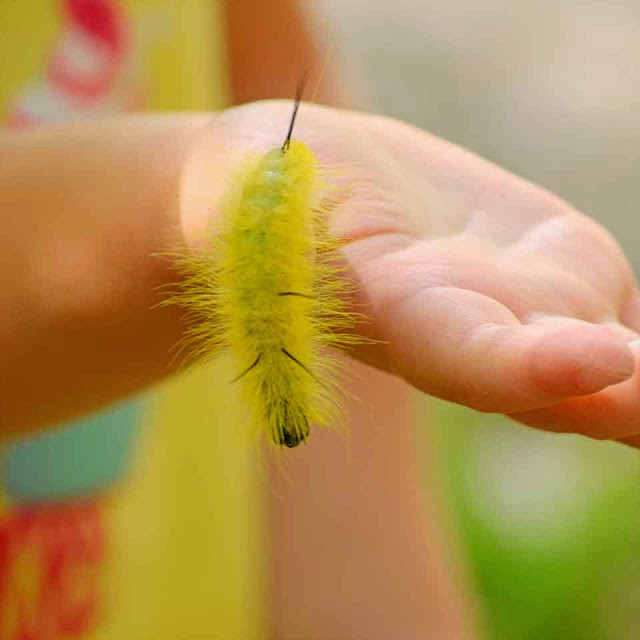 You can also find a link to "stinging" caterpillars in Kelly's post.